A Massive sphere—casting a large shadow onto the surface—has been found on the surface of Mars in an area where once a massive lake existed. 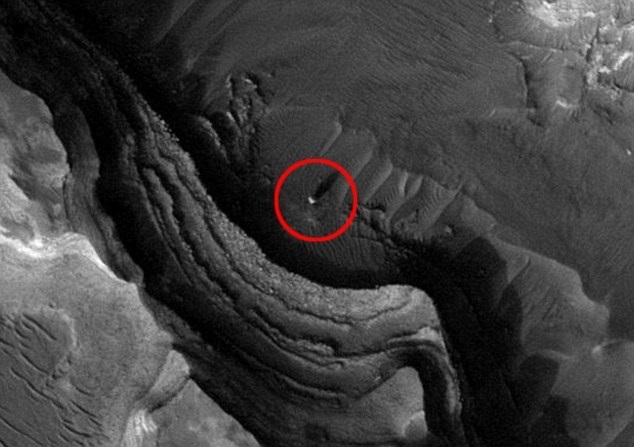 Is this the ultimate evidence of ‘artificially’ created structures on Mars? Countless images of Mars show what many refer to as ‘countless mysteries’ on the surface of our neighboring planet. As we explore new images sent back from NASA’s rovers and satellites on Mars, in some of them we encounter things that according to many shouldn’t be there—at least not if Mars is in fact a desolate planet which never had life. However, a new image promises to change everything we thought we knew about the red planet: There is a massive sphere on the surface of Mars. The image, taken by NASA’s satellite orbiting Mars shows what appears to be a massive sphere on the surface of the planet. The image, snapped by the Mars Reconnaissance Orbiter (MRO) shows a massive structure on one of Mars’ ancient dried up lakes. NASA’s Mars Reconnaissance Orbiter has been carefully orbiting and studying Mars ever since entering orbit around the red planet in 2005. The odd strcuture—which casts a large shadow on the surface of Mars—was spotted by Alien Hunters over at MarsMoonSpaceTV. In a video uploaded by the group, UFO hunters zoom into the image seen on NASA’s website. The area pictured is a region on Mars where once—millions of years ago—a lake existed. The odd structure—which according to many is the ultimate proof of a civilization in ruins—is located on the edge of a GIANT dried up lake that was once covered in water. However, the ‘structure’ may not be as alien as many believe. One ‘scientific’ explanation is that we are looking at a so-called Martian ‘spherule’. Martian spherules (also known as blueberries due to their blue hue in false-color images released by NASA) are the abundant spherical hematite inclusions discovered by the Mars rover Opportunity at Meridiani Planum on Mars. They are found in situ embedded in a sulfate salt evaporitic matrix, and also loose on the surface. However, as noted by national geographic, on Mars, most of the hematite rocks are about 0.16 inches (4 millimeters) in diameter, and no larger than 0.24 inches (6.2 millimeters). By contrast, Earth spherules exhibit a large range of sizes, not limited to only a quarter of an inch. What do you think this alleged structure really is? Is it just another massive rock on the surface of Mars? Or is it possible that this object—and countless others—are the ultimate evidence that Mars was once inhabited?